For more than two decades pen-and-paper role-players have been losing themselves in the dirty streets and glimmering megacorps of Shadowrun, yet only four largely forgettable video games have explored the setting's unique mix of cyberpunk and urban fantasy. Series creator Jordan Weisman would like to fix this oversight. Weisman and his team at Harebrained Schemes want to create the old-school, 2D, turn-based Shadowrun game for PCs and tablets that fans have craved for ages but never received. A game in which the player creates a character, recruits a team of runners, and immerses themselves in hand-crafted tales of magic, machinery and mayhem. They're just going to need a little help. Weisman, a character in his own right, has recruited a crack team of designers and storytellers to make his vision of the perfect Shadowrun game a reality. Unlike the corporate-funded missions in the fictional world he created with FASA back in 1989, however, this particular adventure requires a little crowd-sourcing. Having witnessed the tremendous success enjoyed by Tim Schafer of Double Fine and Brian Fargo of inXile, Weisman decided that Kickstarter was the perfect place to gain funding for his labor of love. Why the Internet Gave This Man $1 Million. In a Single Day. Bellevue, Washington based Harebrained Schemes (of Crimson: Steam Pirates fame) is looking for $400,000 to create Shadowrun Returns. If the ambitious project turns out even remotely as compelling as the plans Weisman laid out for me during a recent interview, it might be worth every penny. "It's a great opportunity, which I have to say I didn't think I was going to get the chance to do"
Outside of the 1993 Super Nintendo game, considered by many to be one of the greatest role-playing games of the era, the award-winning Shadowrun setting hasn't gotten much love in the video game space. The SNES title was followed by a Sega Genesis game in 1994 and a 1995 Sega CD game that never made it out of Japan. And then there's the 2007 first-person multiplayer shooter for the Xbox 360 and PC, which took a more action-packed approach to tackling the setting's marriage of fantasy and science fiction. While it housed some interesting ideas, it couldn't have been further from the Shadowrun pen-and-paper experience. Shadowrun Returns, in concept at least, nails it. "The way that we've chosen to approach this is as a tactical turn-based game," Weisman explained to me during a phone call last week. "You can really get into the kind of highly contextual control opportunities for each character. You're controlling a whole runner group; roughly four to six different character classes. You plot out what they're going to do and then hit the button, watching it unfold and then planning your next move." It's a format that sounds similar to the way traditional pen-and-paper role-playing games play out. Actions are declared, dice are rolled (behind the scenes in this case), results are counted, and the round begins anew. Call it retro, call it old-school; the 2D turn-based format should allow Weisman and company to tackle one of the more complicated aspects of the Shadowrun setting: runs don't take place on one single plane of reality. The Street Samurai, Shadowrun's mechanically-augmented front-line fighters, see the world through the filter of tactical HUDs, a constant influx of environment information and target assessment. To the Mage the world is a web of mystical ley lines and auras. The Shaman dips into the spiritual world that overlays the mundane, and Deckers spend more time jacked into the matrix than reality. In Shadowrun, four people standing in a single small room can each be in wildly different places. That's not easy to represent in today's graphically complex 3D titles. "We want to do (a game) that brings the depth of the Shadowrun universe to life," Weisman told me. Over the years a great many authors have done just that, exploring this unique universe through adventure supplements and tie-in novels, populating the setting with beloved heroes, mysterious anti-heroes, diabolical enemies and powerful puppet masters, pulling the strings from behind a veil of mystery. 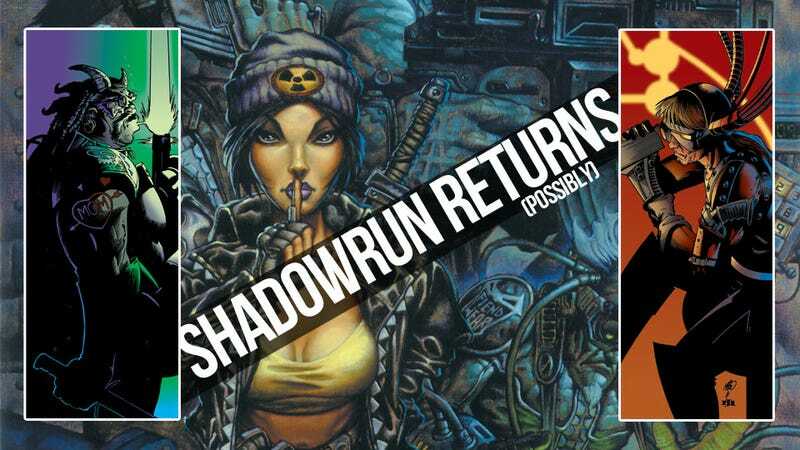 Many of those same authors will be responsible for weaving together the initial stories of Shadowrun Returns. Photo from the authors private collection, a fancy way of saying "I've got some books. Look at them." Weisman, his partner Mitch Gitelman and Mike Mulvihill, who led Shadowrun game development at FASA Corp. will be responsible for laying the foundation of the game's story. From there writers like Michael A. Stackpole, Tom Dowd, Malik Toms, Mel Odom, Jason Hardy and Stephen Kenson will step in, each taking the story in their own direction, weaving together a rich, multi-layered story. "It's kind of like a braided anthology," said Weisman. "We'll create a strong central narrative to the game, and then each of the authors will write a self-contained short story that becomes part of the overall character arc." Those stories will also be collected in a hardcover Shadowrun Returns Anthology, available exclusively to backers of the game's Kickstarter campaign. And when the official story ends, the players' stories begin. When the game is released Harebrained Schemes will also release a level editor, allowing gamers to create and share their own adventures in the Shadowrun universe. "It's a great opportunity, which I have to say I didn't think I was going to get the chance to do," said Weisman. "The kind of game that we really want to make is in that unfortunate middle ground of being way too big for us to pull off ourselves, but way too small for a publisher to be interested in." So Weisman and Harebrained Schemes turn to Kickstarter, hoping that the Shadowrun property evokes enough passion in fans to generate the $400,000 necessary to get the project off the ground. Fans of the property have been burned before, and Weisman wants to make it right, even if it means sacrificing the executive producer of 2007's first-person shooter (skip to 1:35 in the video for some much-needed catharsis). Will Shadowrun Returns' Kickstarter succeed? Is there still crowd-sourced money to be made? It just went live, so we'll find out soon enough.